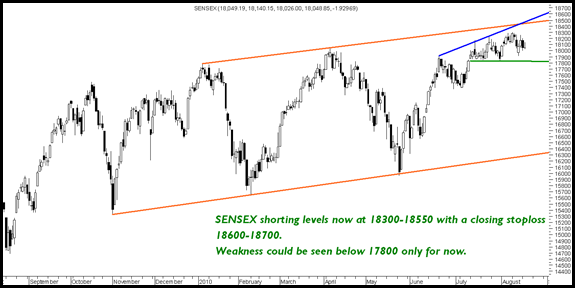 Sensex – Will it continue to flip flop between 18500-17800 ? In the last few days nothing much has changed but the higher bottoms being made suggests a move possibly to 18300-18550. For now i expect volatility to increase as we reach 18300-18550 zones which can some good trading opportunities on Options as well as Index. Not many charts today but a quick view. Hindalco buy above 170 for an intra day tgt of 175. Elecon Engg and Garden Silk Mills look interesting on charts. Watchout for any price volume action. Hindustan Motors has given a technical breakout…. Is it indication of some news in the offing maybe yes … Buy on dips with a stop of 25. Tata Coffee has given a breakout the stock may head to 550 in next few sessions. SMS PUMP AND DUMP CONTINUES !!! Many stocks like FCS software dumped from 9 to 2.5 rs with supporting announcements !! Nimbus Food , Sumedha etc etc. Still people get duped reading into this smses. Can you pls provide your views on aarti drugs and aarti industries? Also there is a rumour of bonus in aarti drugs in the coming AGM and there is a notification regarding development of land? Gold is not a instrument we trade but an academic exercise ! First of all i would be banning you from posting further as you dont disclose ur identity even after me asking ! Well blog is a free service ! cant expect more then this.